I play this game way too much and after weeks, actually probably more like months, of failing this level I decided to delete it...It was not fun, it was not enjoyable, I was getting frustrated beyond belief and I thought why am I doing this....? 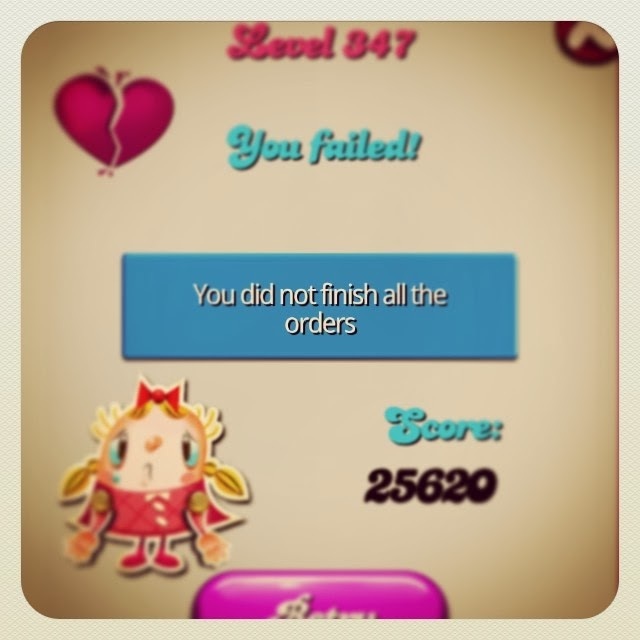 So Candy Crush....be gone with you! Linking with Finding Myself Young, My Little Drummer Boys and Twinkle in the Eye . I am so glad I never got into Candy Crush... but I have played a LOT of other games that start so good and just end up being like an addiction or compulsion and not even fun anymore! lol. I have also found the freedom in deleting those games. It's a great feeling isn't it!! Oh I didn't install it once I got my new phone and my tablet...it was interrupting my sleep and I didn't even get at far as you did --- I was on level 70-something. So addictive, isn't it??!! It's ridiculous how it just sonsumes your life!! Am now feeling free... Lol.. I played it once with my then six yr old and we killed 65 lives on my niece's game - I had no idea till later how COOL she was about it considering . Linky is up now Zita. I spend waaaay too much time on candy crush! I have no clue about Candy Crush! I never played it. That would be so frustrating, fancy getting to such a level and not be able to go on. I never really got into it. I get frustrated easily so I deleted it once I got stuck on a level lol. I played for a week and then gave up. I got stuck on a level and got stressed and then went "what am I doing?!" I deleted the app and wenty in search of a life! Lol. Two words: Bingo Blitz! When I finish that I'm deleting all my games and never touching another again...we'll see!